Kristin Campbell has always loved exercise and physical activity. As a high school student, she played on the teams and her dream job was to be the athletic trainer for the men’s tennis tour. Immediately following the last exam for her physical therapy degree at Queen’s University, she boarded a plane for Vancouver to snowboard and work as a casual physical therapist at Vancouver General Hospital. Flipping through one of Vancouver’s free magazines, an article about the first dragon boat team of breast cancer survivors caught her attention. Two UBC professors were quoted in the story—Dr. Don McKenzie of the School of Kinesiology, who started the team, and Dr. Susan Harris of the Department of Physical Therapy, who paddled with the team. Kristin had written an honours paper about how exercise may lower women’s risk of estrogen-related cancers, so she decided to explore opportunities to research this topic in the School of Kinesiology. 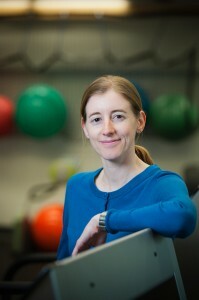 Now an Assistant Professor in the Department of Physical Therapy at UBC, Dr. Campbell is investigating the role of exercise in rehabilitation from cancer treatment and how to use exercise in health promotion for cancer survivors after they complete treatment. One of her current projects is looking at the role of exercise in chemo-brain (cancer-associated cognitive dysfunction), or the difficulty cancer survivors sometimes experience with problem-solving and multi-tasking. She also plans to develop a prospective model of care for breast cancer survivors, which would measure arm function before and after surgery to ensure range-of-motion and strength are regained and for the early detection of lymphedema (swelling of the arm). Dr. Campbell also recently received funding to develop pelvic floor muscle training for women who were treated for gynaecological cancers. As she looks back on her career since graduating from the School of Kinesiology, Dr. Campbell is most proud to have been invited to participate in discussions for the development of the American College of Sports Medicine’s exercise guidelines for cancer survivors. She was also invited by the American Cancer Society to participate on an international panel of experts to develop prospective models of care for breast cancer survivors, which were published in a special supplement of the journal Cancer. But looking forward, Dr. Campbell’s ultimate goal is to develop rehabilitation for the cancer survivors of British Columbia.